The Jimmy Titanic play comes to the New Rep Theatre for a five-night stint from Wednesday June 19th through Sunday June 30th 2013. This is Titanic like you've never seen it before. Having gone down with the ship, Jimmy has rock star status in heaven; flirting with angels, rewriting history and with a direct line to an unlikely God - Jimmy Titanic is a unique and, at times, hilarious take on the story of the greatest ship ever built. Set between Heaven and the ship, Jimmy Titanic follows the story of two proud shipyard workers from Belfast who made it on to Titanic and who still haven't quite made it off. Ship building was their lives. Titanic was the time of their lives. And even now, in heaven, one hundred years later, they step back aboard Titanic every day - riding its notoriety, struggling with its legacy, forever consumed by 'the Wondership'. 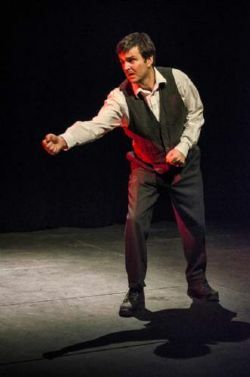 Produced by TirNa theatre from Boston, Jimmy Titanic had its world premiere at the Drilling Company Theatre in New York in September 2012 as part of the Origin Irish Theatre Festival. Jimmy Titanic play takes place from Wednesday June 19th through Sunday June 30th at the New Rep Theatre Boston (321 Arsenal Street Watertown). Visit www.newrep.org for more information.